There's nothing better than gazing upon some old photos to rekindle an old memory, and if you're a fan of the game then vintage pics provide a glimpse into an era that is likely well past your time. 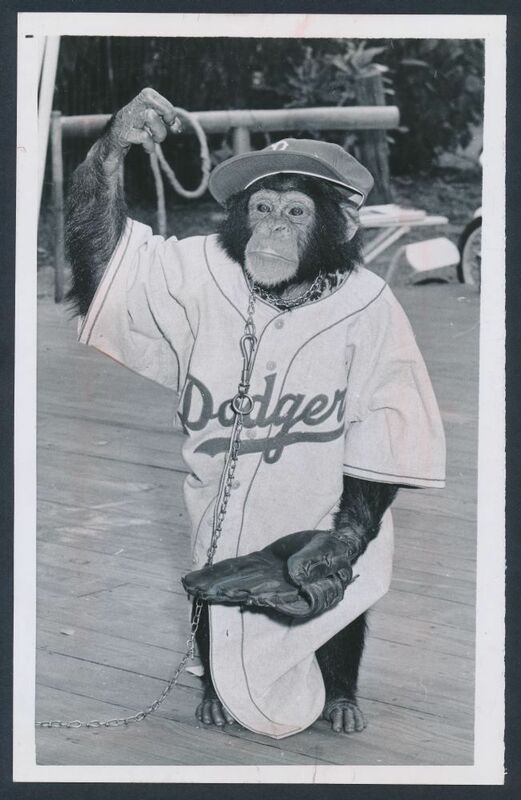 That's why I love sharing Dodger photographs I run into online, and especially enjoy pointing to auction house pics since many of them are scarce and rarely ever seen. Currently ongoing is RMY's June auction and there are several Dodger press photos available that have me smiling, snickering and guffawing in joy. Braves fans always suspected, this is a member of the Brooklyn team. Dispatches from the spring training camp at Vero Beach are trying to palm him off as a mascot - but just wait until the lineups are announced in the regular season. I guess the joke's on Braves fans since the Dodgers took home that championship for the first time that season. Maybe this monkey was, in fact, our good luck charm. 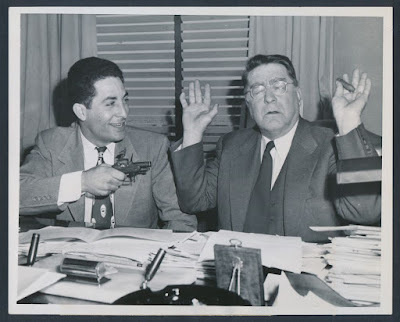 It's from hold-out to hold-up for Dodgers outfielder Carl Furillo as he pulls a cigarette lighter pistol on Dodgers President Branch Rickey, Feb. 21. Furillo, who ranked fourth among National League hitters in 1949 signed his contract for an unannounced sum, at the offices of the Brooklyn Dodgers Baseball team in Brooklyn. There had been some disagreement as to the salary, but it had been settle before Furillo pulled the pistol. Furillo actually never held-out, but instead threatened too on numerous occasions while playing for Brooklyn. 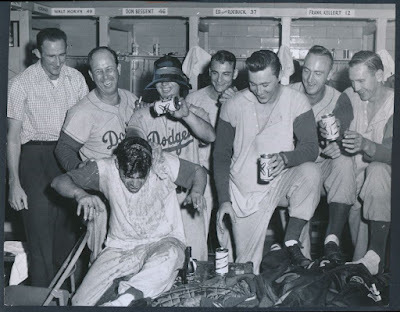 Celebrating in the clubhouse after clinching the National League pennant at the stadium Thursday, members of the Brooklyn Dodgers get a laugh as second baseman Don Zimmer gives batboy Charles Di Giovanna a beer shampoo. Zimmer is wearing pitcher Don Newcombe's beer soaked straw hat. Others, from left, are pitchers Roger Craig, catcher Homer (Dixie) Howell, pitchers, Don Bessent and Billy Loes, first baseman Frank Kellert and pitchers Russ Meyer and Sandy Koufax (background). 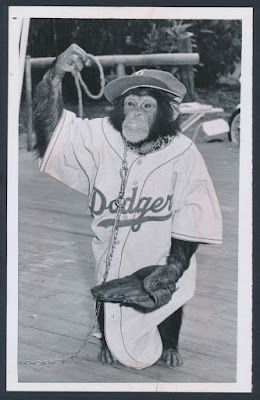 The Dodgers officially became champions by whipping the Braves, 10-2.
Who's the monkey now? Braves fans!